For a while now I’ve been getting excited for Christmas and the thought of sharing it with our kiddos who are getting old enough to enjoy it more this year. I want to do something special with them each day until Christmas. Something that they help me do and look forward to each day. I remember baking a Christmas treat with our mom each day for 2 weeks until Christmas. I’m thinking something along those lines. An advent calendar seemed just the way to do this and help the kiddos visually see when Christmas would arrive. So I pulled out an old box of envelopes that I’ve had since high school (I know, crazy. I think the glue no longer works, so this project is perfect). I cut off a 1/4 inch of one of the sides (so that we can put our daily activity inside). 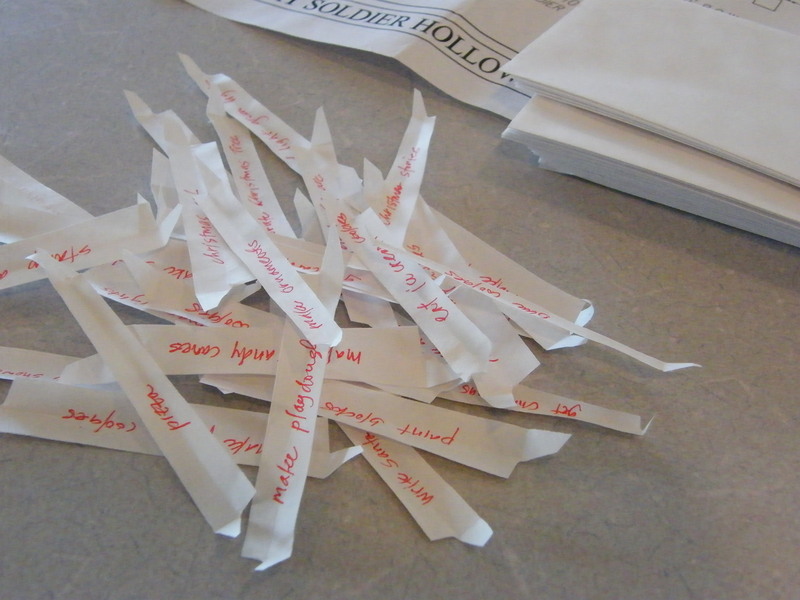 With the pieces that I cut off, the kiddos and I opened the small papers and wrote things we would like to do together. In general, the builder’s ideas involved making cookies, and the dancer’s responses mostly had ‘pizza’ included. According to the kiddos, we will be making football cookies, a snow fort, pizza cookies, and blue cookies. I wrote dance to the nutcracker, go see Christmas lights together after dark, etc. 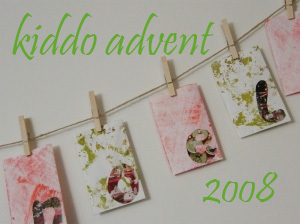 I’m going to try and post our advent adventures each day, so you’ll just have to wait and see what else we planned. After we finished our activity inserts, I glued the envelopes shut with a glue stick, so when the envelope is turned vertically, the top is open. 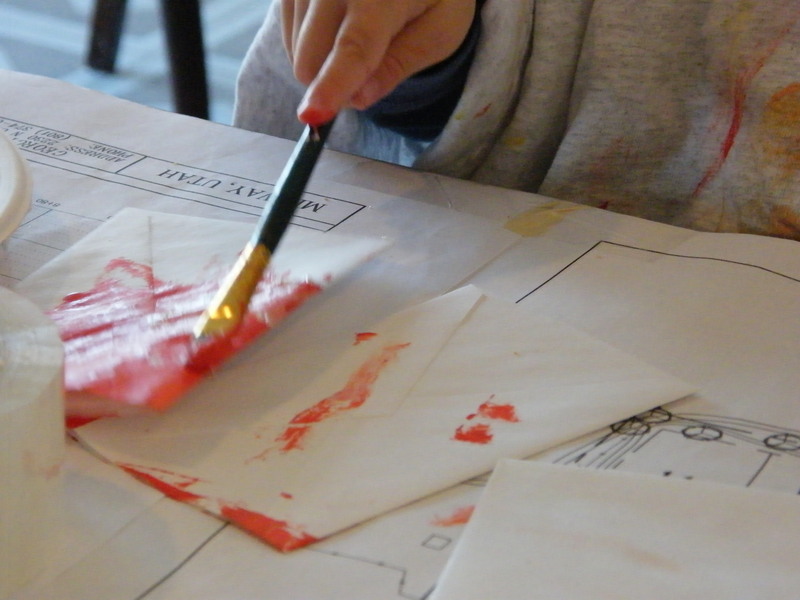 We then began painting both sides of the envelopes in hues of red and green. 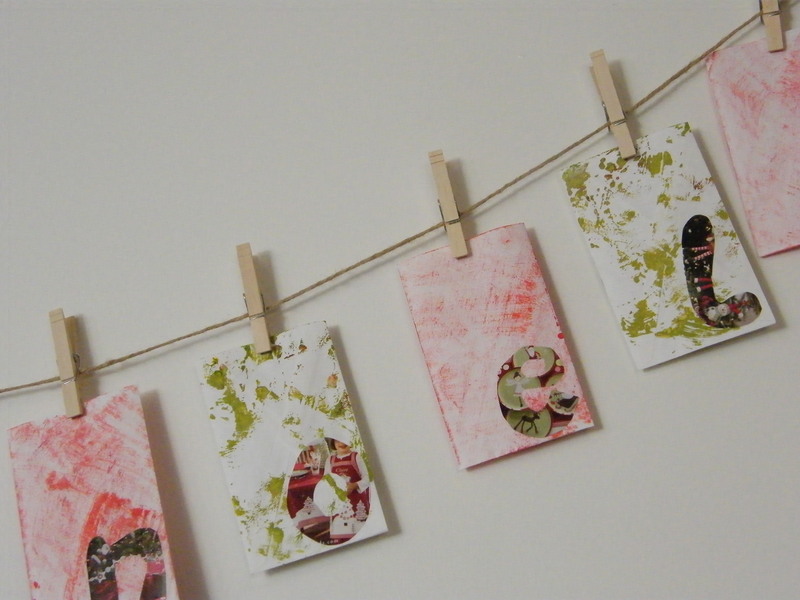 We used paint brushes, our fingers, and did a bit of print making as well. I let them do whatever they wanted, and we all enjoyed ourselves. As the envelopes were drying, I cut out letters with my holiday Pottery Barn catalog, to spell Merry Christmas, and Bon Noel, as well as some stars, the word peace, stockings, and a reindeer. There is one letter or image for each envelope, besides a few envelope spacers between the words that I left without magazine cutouts. While I was cutting the letters, the dancer was busy cutting magazines as well. After lunch, the dancer took a nap and the builder and I finished our project. We found some old string, pieced it together, and hung it on our wall in the dining/kitchen area. The activity papers were put into their envelopes (I looked at the calendar as I placed them, to make sure that the activities we would want to do with the designer would fall on the weekend). As I hung the envelopes by wooden clothes pins, the builder took left over string and constructed with it and our dining room chairs. The grower happily played in his swing and watched us. The project took the majority of our Saturday, but I think it will be soo much fun. Looking forward to a fun filled holiday! ok….so i’m going to do this. great idea! i STILL love this delights blog! thanks for putting so much effort into it! !